As the old adage goes, “Every cloud has a silver lining.” It’s hard to believe there is a bright side to the unprecedented cancellation of UFC 151, but now that the dust is starting to settle on Jon Jones’ decision to decline a last-second bout against Chael Sonnen to salvage the September 1st event, some winners have emerged from the debacle. 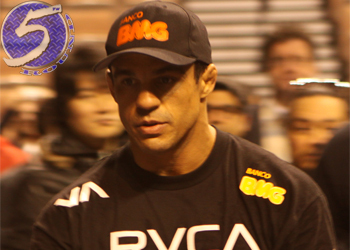 First and foremost, Vitor Belfort (Pictured) went from battling Alan Belcher to get back in the middleweight title hunt to leapfrogging directly into a light heavyweight championship affair. Furthermore, volunteering to meet the 25-year-old directly after Lyoto Machida decided one month wasn’t enough time to prepare for a rematch with Jones proves to Octagon officials that he’s the ultimate company guy. That goes a long way in the eyes of UFC owners Dana White and Lorenzo Fertitta. Look for “The Phenom” to receive a hefty (top secret) discretionary bonus check after his brawl with “Bones” – win, lose or draw. Next up, the one and only, Chael P. Sonnen. Believe it or not, Uncle Chael’s reputation is currently blinging brighter than the UFC title that has continued to evade his grasp. Not only was White singing his praises during Thursday’s conference call because he was willing to face the baddest 205-pounder on the planet on just eight days’ notice, despite the fact he hasn’t competed in the division in nearly seven years and hasn’t done much but sit behind the FUEL TV desk following July’s loss to Anderson Silva, he also scored a six-minute spot on ESPN’s SportsCenter to showcase his smack talking skills. Granted Sonnen had nothing to lose and everything to gain from the matchup, but there was no hesitation on his part to step inside the Octagon opposite Jones. White and fans alike tipped their caps to the one-time political hopeful. Lastly, Canadians and Minnesotans. Due to UFC 151’s cancellation, UFC 152 in Toronto and UFC on FX 5 in Minneapolis have benefited greatly from the fallout. Instead of the flyweight finals between Joseph Benavidez and Demetrious Johnson headlining the September 22nd festivities, Jones and Belfort now serve as the card’s featured attraction. The welterweight affair with Charlie Brenneman and Kyle Noke was also transition to the Canadian card. As far as the birthplace of the now-Los Angeles Lakers is concerned, the 125-pound bout with Jussier da Silva and John Dodson will no longer co-headline the October 5th show. Welterweights Jake Ellenberger and Jay Hieron, UFC 151’s prior co-main event, now gets second-to-top billing. In addition, Shane Roller vs. Jacob Volkmann and Danny Castillo vs. Michael Johnson tagged along to Minnesota with the 170-pounders. See? It ain’t all bad. So stop hating on Jones and coach Greg Jackson. Okay?